Firefighters throw water through a hose as a wildfire burns near the village of Psahna, in Evia, Greece on Aug. 12, 2018. 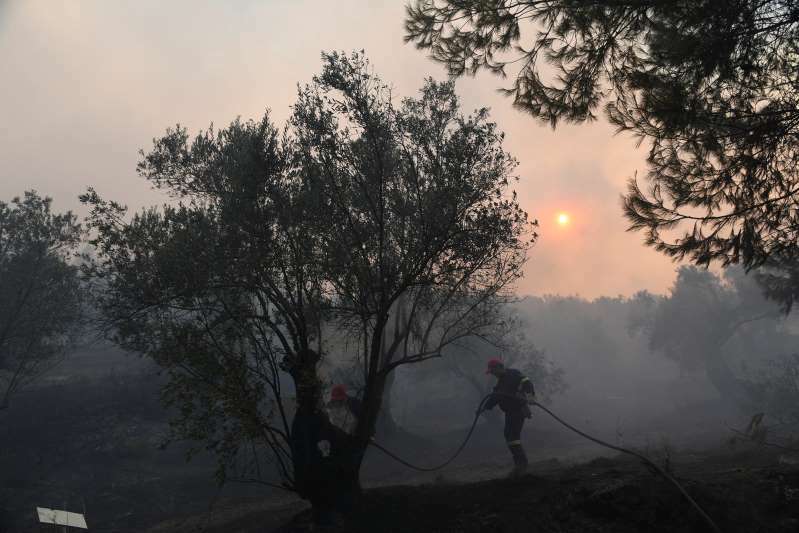 Greece's fire service says a wildfire raging on the island of Evia, in central Greece, has forced them to evacuate two villages and a monastery. Traffic on the main road that runs across the length of the 180-kilometer (110-mile) island has been stopped near the fire, police say. They urge people wishing to drive to Athens from northern Evia to use ferries to the mainland, which will operate throughout the night. Normally, drivers would cross a bridge at the narrowest point separating Evia from the mainland, which is south of the fire's location. Greece's most devastating wildfire, at a seaside resort east of Athens on July 23, killed 94 people, with several more hospitalized in serious condition.